QUICK TIP: DMA2100/2200 will work with Vista/Windows 7 Home Premium and Ultimate but with limited plug-ins for Windows 7. WMECA54AG will only work with Windows XP Media Center PC 2005. 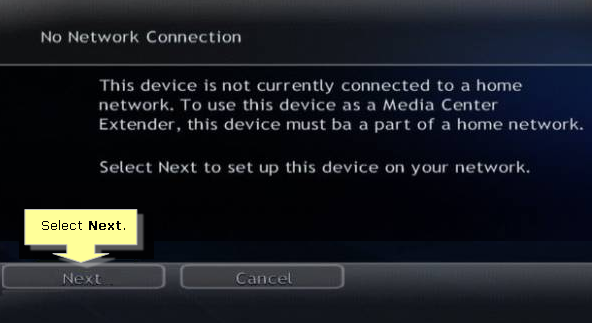 NOTE: Make sure that the Digital Media Extender and the Vista computer are on the same network and the Internet is working. NOTE: It is advisable to use a dual band-N router (WRT600N, WRT610N or E3000) in order to accommodate the bandwidth necessary for transmission. Connect the antennas to the back panel of the Digital Media Extender. The antennas should be screwed on in a clockwise direction. NOTE: The antennas should be raised when the Extender is in use. Connect the RCA video cable to the Digital Media Extender. For instructions, click here. NOTE: Make sure to power OFF the TV before connecting the Media Extender. Connect the RCA audio cable to the Digital Media Extender. For instructions, click here. Plug the Media Extender’s power cord connector to the unit’s Power port located on the back panel. Plug the cord into an electrical outlet. Power ON the Media Extender using the ON/OFF switch located at the back panel. NOTE: The initial startup of the Extender could take up to one minute. 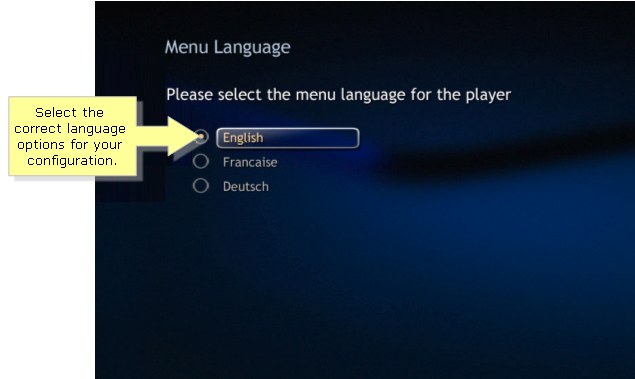 Use the arrow keys to select the correct language options for your configuration. Press OK on the remote control. NOTE: In this example English is selected. Configure the Display Connection by selecting the type of connection the TV supports. 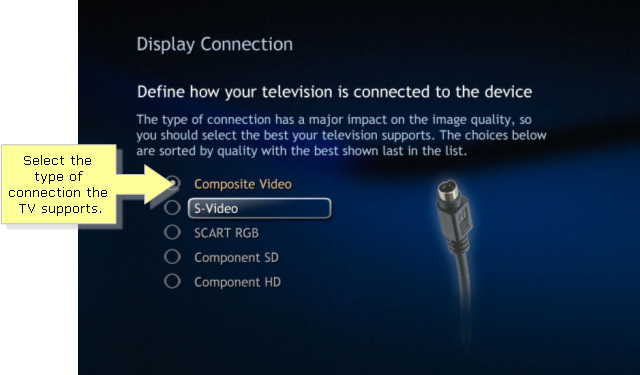 NOTE: In this example Composite Video is selected. 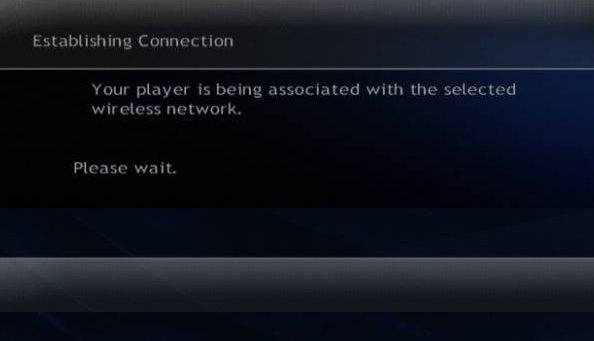 Select the type of network you wish to connect to. 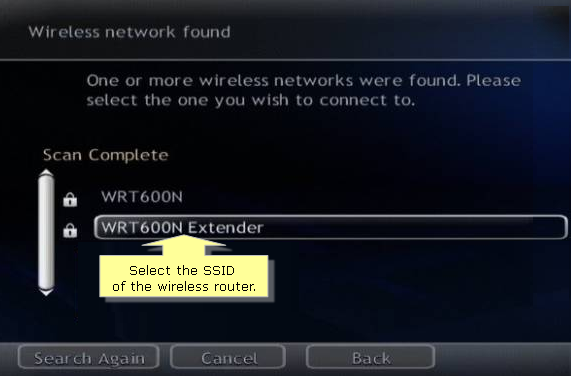 Since the Media Extender will be wirelessly connected to the router, select Wireless. Then, Press OK on the remote. 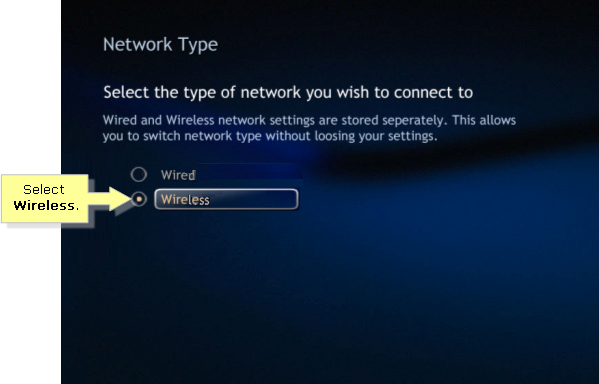 NOTE: To check the current wireless settings of the Linksys Wireless-N router, click here. If you are using Linksys Connect, click here. 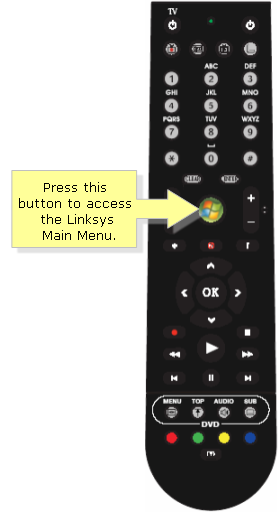 Press the Media Center button on the remote. 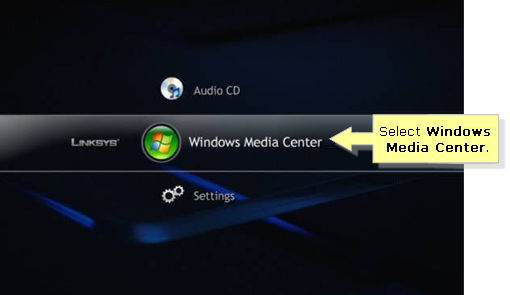 In the Main Menu window, select Windows Media Center. 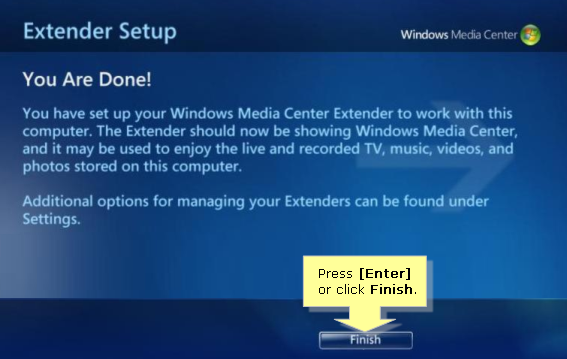 Select Next to setup the Media Extender to the wireless network. Select the SSID of the wireless router then press OK on the remote. Select Wireless Encryption to set the security level on the Extender. NOTE: The security level chosen on the Extender setup screen should match your router security. 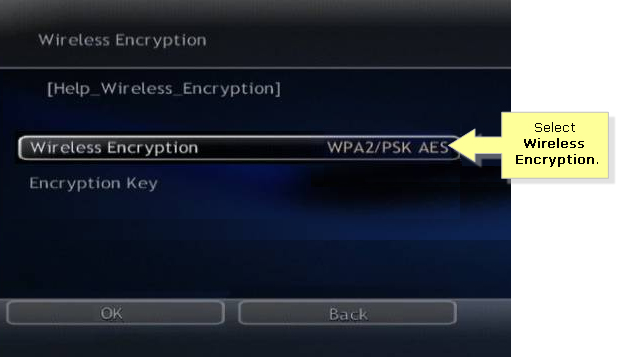 In this example WPA2/PSK AES is selected. 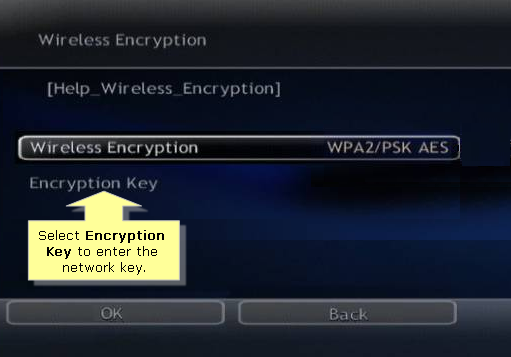 Select Encryption Key to enter the WPA key on the Extender. 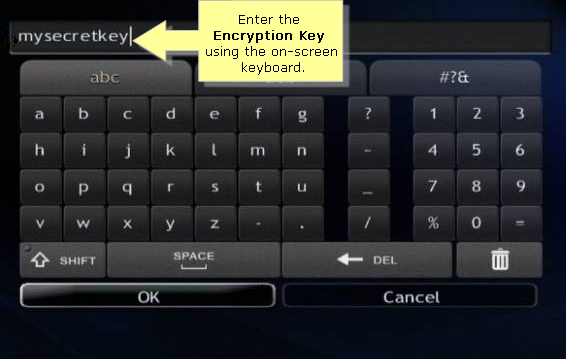 Enter the Encryption Key using the on-screen keyboard then press OK. NOTE: In this example "mysecretkey" is the Encryption Key. Wait for the extender to establish connection with the router. 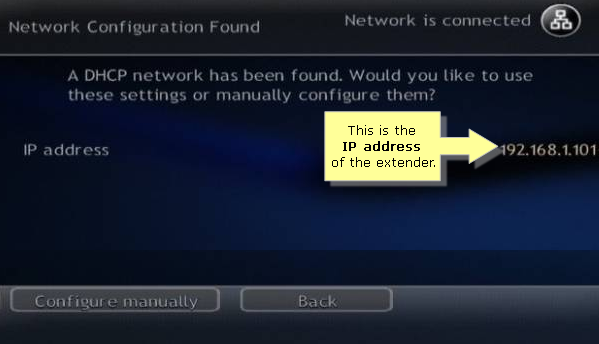 Once the Extender is connected, check the IP address then select Use This. 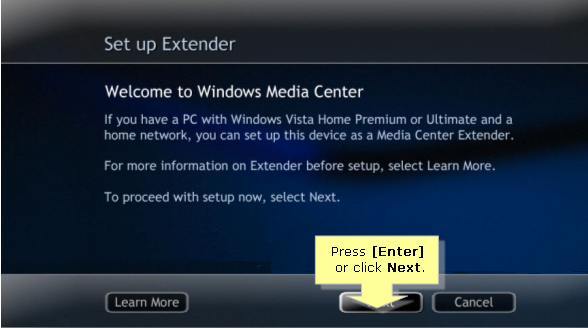 Register the Media Extender to the Vista computer. For instructions, click here. Insert the CD that came with the Media Center Extender on the Vista computer. NOTE: Update your Windows Vista computer if you are using a compatible Windows Vista version. 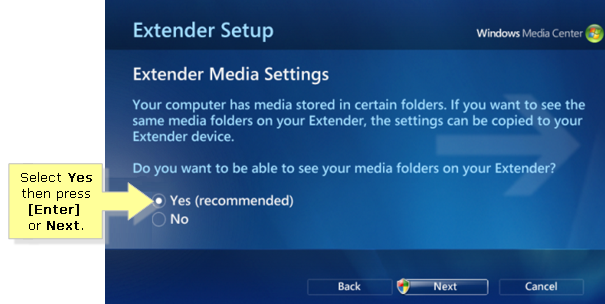 When the message Found Windows Media Center Extender appears, click on the screen or select Yes to start the setup. If the Extender was not detected, follow the steps below. Otherwise, proceed to Step 6 to continue. 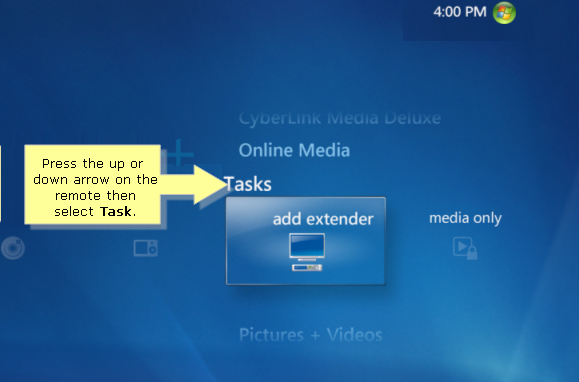 Open Media Center on the computer and press the up or down arrow then select Tasks. Press the left arrow and select settings. Press the up and down arrow to highlight Extender and then press the up arrow to highlight add extender then press [Enter]. 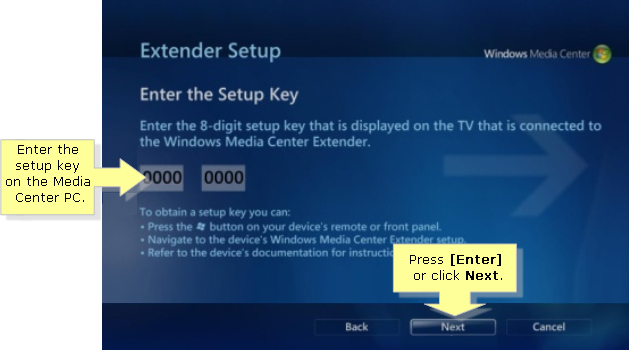 Enter the setup key from the Extender then press [Enter] or click Next to continue. The next screen may ask about firewalls and changing settings on the computer. Press [Enter] or select Next to continue. NOTE: Third party firewalls need additional manual configuration in order for the Extender to work with the Windows Vista computer. The next screen will prompt you if you want to make media files stored on your computer available. Select Yes then press [Enter] or Next to continue. The next screen will ask you to allow some computer settings, including Away Mode, which allows your Extender to work even if the computer is powered OFF. The final setup step configures the computer to work with the Extender. When the configuration is complete, You are Done! message will be displayed. Press [Enter] or click Finish to exit the setup. NOTE: If you encounter any problems and difficulties, try to update your firmware. For instructions on how to update your device firmware, click here.